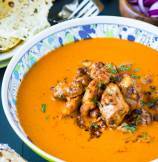 Today, Indian Chicken Tikka Masala recipe gets a spicy makeover with smokey kick of chipotle. It is like enjoying two favorites in one bite - chicken tikka and chipotle chicken!! (forget pictures, I'm even drooling saying these names!) Scrumptious! This is one of the recipe which showcase my Indian heritage and my never-ending love for Mexican flavors. However, not just because I love these two, the smokey flavor of chipotle was meant to meet Tikka Masala. In traditional cooking, spiced chicken tikka is cooked in high heat wood burning clay oven which cooks chicken fast, keeps it moist inside, and also gives signature smoky char skin. 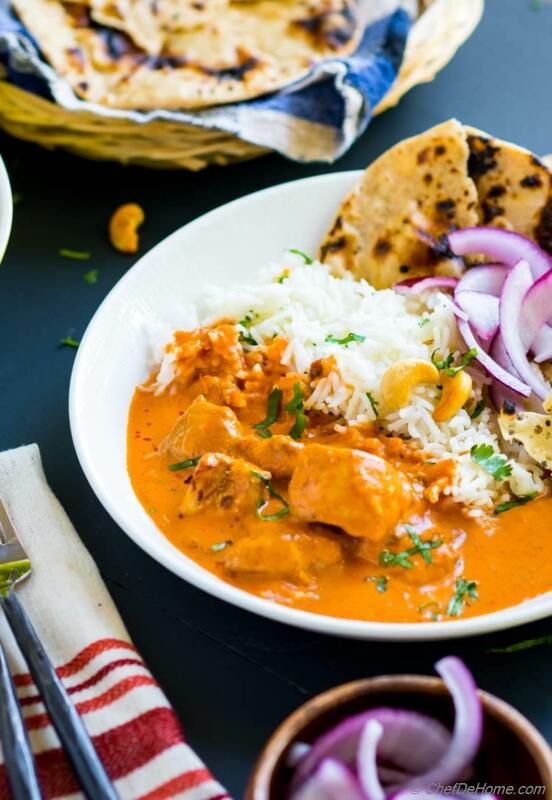 Chipotle gives that smoky flavor to tikka masala without oven. Who knew!?! 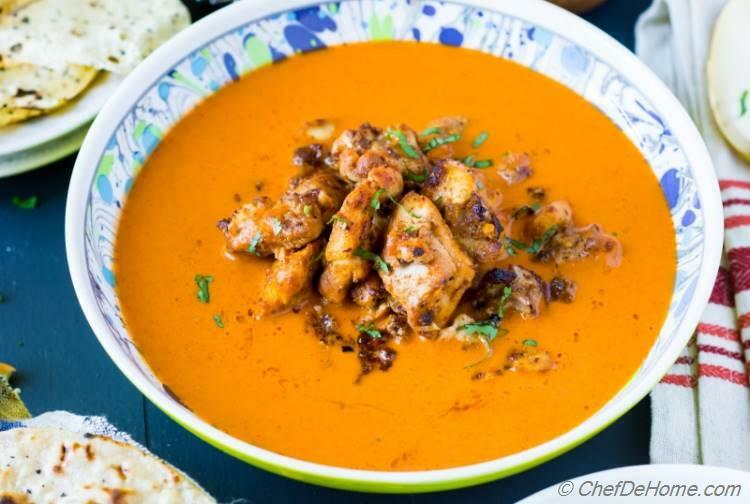 Seriously, spicy chicken tikka coated in creamy Tikka Masala sauce with hint of sweetness... You will not believe until you try it how amazingly these two compliment each other. 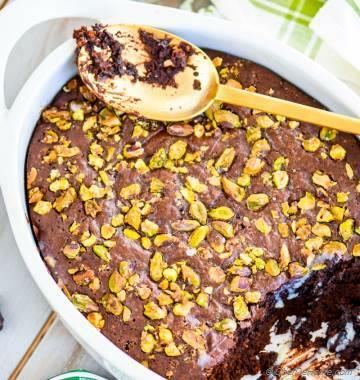 Remember, I told you yesterday I'm sharing my holiday family favorites this week?! Now, that collection can't be finished in one week. For sure! but I'm trying to share the most popular ones. Also, it cannot be complete without Chicken Tikka Masala. So here I'm, sharing taste of my fusion kitchen with spice of garam masala and heat of chipotle, all in one dinner favorite! 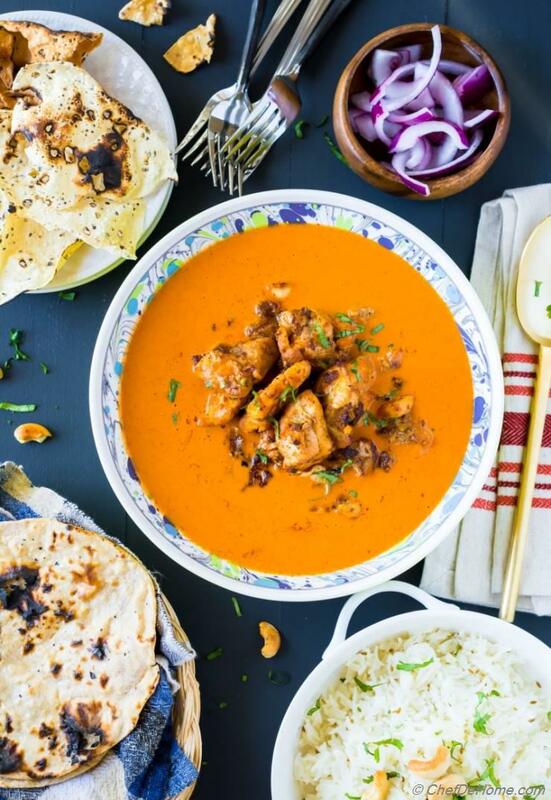 This tikka masala recipe is very close to my heart. I think it also one of the very first recipes I shared on blog when I started. Old recipe is how I grew up eating and today's take is how I started cooking. I remember, Vishal used to call me (before marriage) and tell how much he loves Mexican flavors. When I joined him after marriage, I started cooking a lot of his favorites at home. 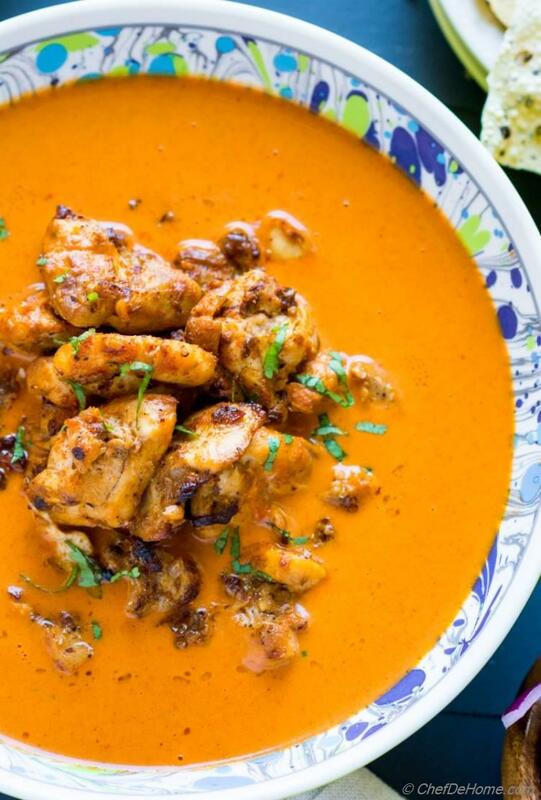 Honestly, these day we eat chipotle chicken more than we eat chicken tikka masala! lol! So goes the list of Chipotle recipes on the blog.. I wonder, where to start!?! You can check all of them here. Now, before I get too lost in my stories.. I want to share that this homemade Chicken Tikka Masala is far better than you had ever had in Indian eateries. I promise. Plus it is super easy to put together. To add extra flavor in all of my chipotle marinades, I like to use a teaspoon of adobo sauce along with one or two minced chipotles. 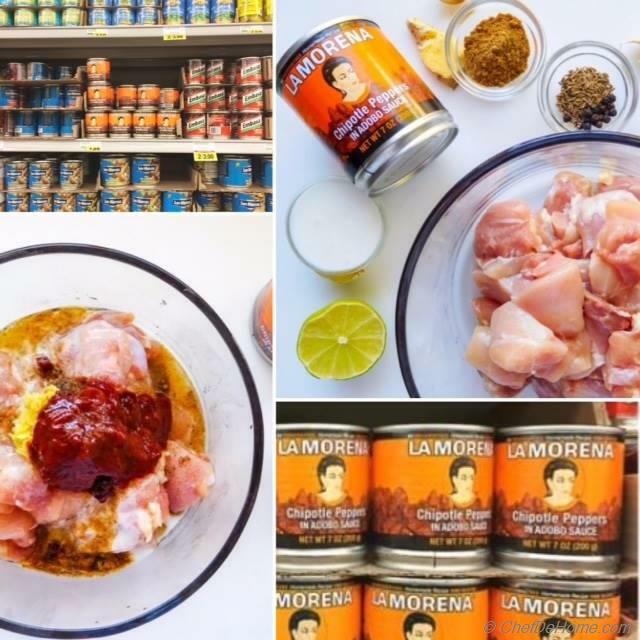 La Morena products are very good and high quality. 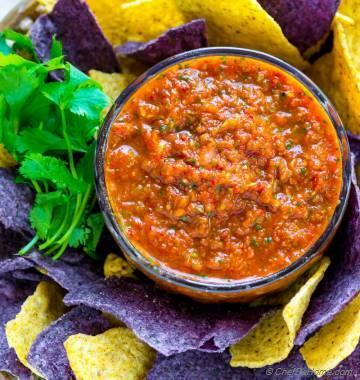 I used their chipotles, and jalapenos to spice-up this recipe today! Marinating chicken for tikka masala, I cut the chicken in small 2-3 inch cubes. Then, mix all the marinade ingredients with chicken until all of the chicken is coated evenly. I refrigerate it for better flavor for 30 minutes to overnight. The real taste of Chicken Tikka is in how you cook it. I like to broil it for that same charred smokey flavor which Indian restaurants achieve by cooking chicken in tandoor (high heat clay oven). This is how it gets the name - Tandoori Chicken Tikka. My family shares special love for Chicken Tikka. I like to make a big batch of chicken tikka and serve half for appetizers and half with tikka masala sauce. I saved a small plate of tikka from this batch and we devoured it even before I clicked pictures of the main dinner. Tikka Masala sauce comes together while tikka is cooking in the oven. So, I have adjusted the cooking time of recipe assuming you will cook sauce while tikka cooks. If not, chicken tikka takes about 14-15 minutes to cook and sauce is ready in about 20 minutes. After both are ready, I recommend cooking the chicken with sauce for 1-2 more minute. 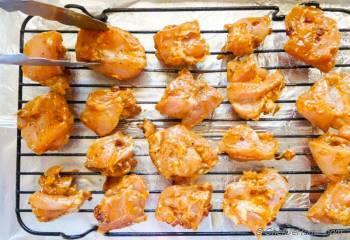 By doing so the flavor of cooked chicken mingles with tikka masala sauce, giving complex flavor to the sauce. Also, chicken stays moist and does not taste very spicy due to coating of sauce. 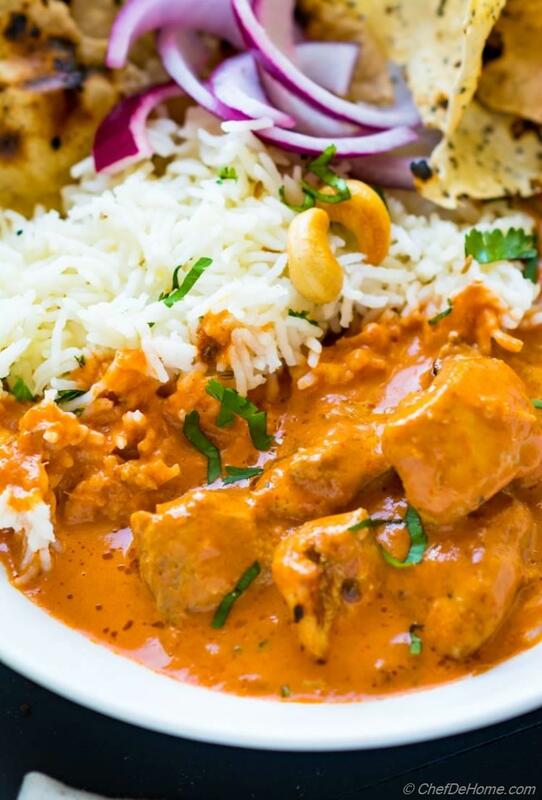 Speaking of dinner, Chicken Tikka Masala is best when served with side of basmati rice or naan. You can find both recipes on my blog. I added links in suggestion below. Make-Ahead: Tikka Masala is a kind of recipe which should be made ahead. 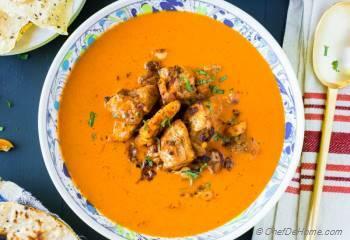 The flavor of the sauce and tikka gets even better when sits overnight in refrigerator. I easily make Tikka Masala sauce 2 days ahead. Chicken can be marinated overnight too, can also be made a day in advance. However, If you making extra and planning to serving half of it for appetizer round, then I recommend broiling it the day of event. If serving all in sauce, then make ahead and refrigerate with sauce. Heat it well before serving. Chipotle Chicken Tikka Masala is so popular in my family, it will sure be in this year's holiday menu. What is family-favorite must-have holiday recipe? Leave a comment below and let me know. 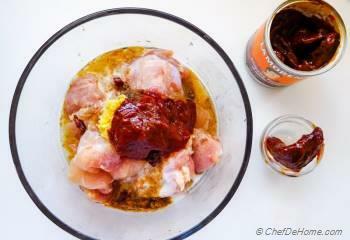 Smart Swap Double the marinade and chicken, then serve one portion in appetizer. 2. For cooking Tikka Masala, Set oven to broil. Skew chicken in skewers or place on a baking tray, Broil chicken for 15 minutes, about 6-7 minutes each side or until chicken is fully cooked. Turn chicken up side down after 6 minutes to cook evenly both sides. 3. 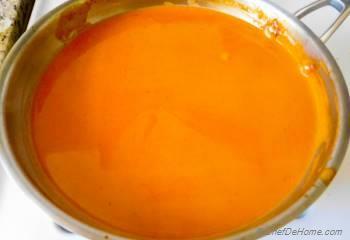 Tikka Masala Sauce: While chicken is cooking, melt butter in a pan. Add 1 tsp sugar and let is caramelize. (about 30 seconds). Now, add remaining 1 tsp garam masala, 1 tsp cumin powder, and 1 tbsp ginger garlic paste. Saute for 30 seconds. Don't let garlic burn. 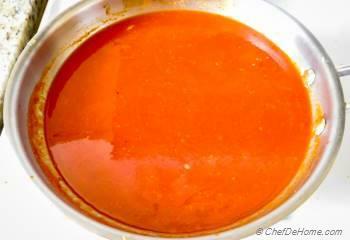 Now, add tomato puree with paprika, generous pinch of salt and remaining sugar with 1 cup of water. Bring to boil and then simmer for 15-18 minutes or until sauce thickens and spices release aroma in the sauce. 4. Add heavy cream and continue cooking for 5 more minutes. 5. Add in cooked chicken in the sauce and cook 1 more minute. Remove in a bowl, garnish with fresh chopped herbs. 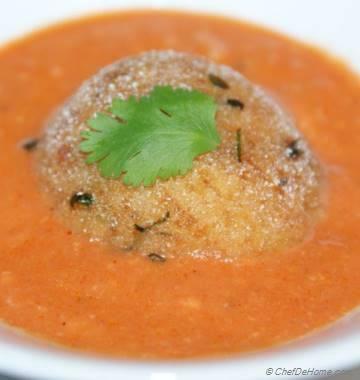 Serve with naan and/or rice for an Indian dinner at home. Hi Goht, tomato pastes in my experience are way more concentrated than tomato puree. So 18 ounce will be too much for this recipe.. I would use 2/3 and dilute with water. I hope it helps. This is totally new to me. We love eating chicken tikka in Indian restaurants but I never tried chipotle with it. Can't wait try this combo. Thanks for sharing. Thanks, Courtney! 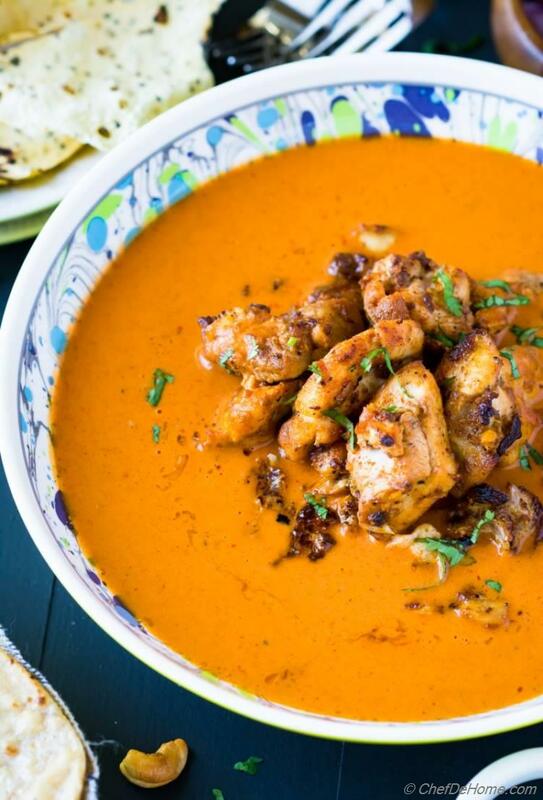 If you like spiced food, you will love combination of chipotle with chicken tikka masala. I hope you get chance to try it soon.